Have you ever had that nightmare when you are walking around at night and you realize that it is Halloween and you still don't have a costume? We've been there. It's a spooky thought, getting caught unprepared on the most macabre night of the year. Here's the thing, we like the idea of propping up your costume wardrobe with some key pieces that will make it easy to go from trendy to terrifying in a matter of seconds. That way, even if you have that big meeting with your boss at five on Halloween evening, you can throw on your costume before you even hit the streets. No one will ever accuse you of not fully partaking in this holiday just because you are doing your best to adult! This bones poncho is lightweight and easy to transport so it can be worn all day while you remain comfortable, or stowed away in a bag so that you'll be ready to show your undead spirit as soon as the quitting time whistle blows. It has a jagged hemline, giving you a gorgeous profile for an Instagram worthy Halloween photo shoot. With a rugged ribcage printed on a black fabric, this piece can easily be dressed up or down to put your unprepared Halloween fears at ease. It turns out, having certain skeletons in your closet isn't too bad. In fact, it can make you into quite the prepared Halloween reveler. And get this, it doesn't cost a lot of bones (sorry, not sorry. We had to sooner or later). Take this look to a whole new level with Dia De Los Muertos makeup and a gothic black wig. Or just keep it simple and have a good time. 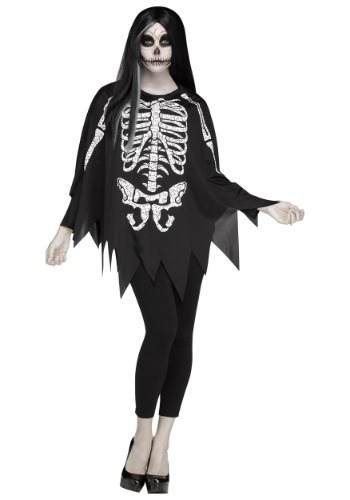 It's your skeleton poncho and you'll do what you want!